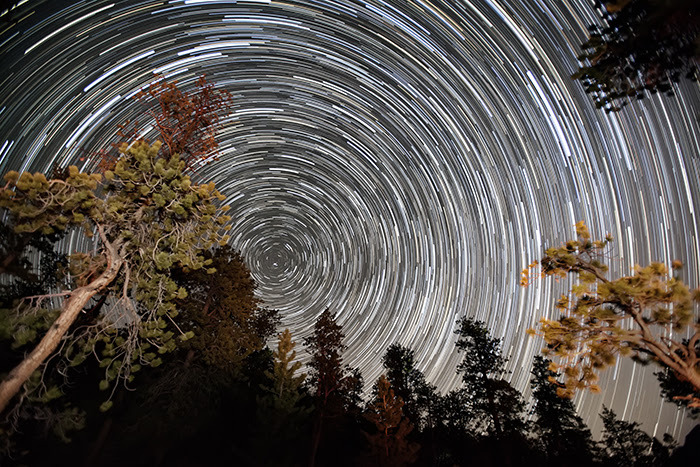 It's tough to resist star trail photography whenever we're out in a relatively dark area. Granted, "relatively dark" for a Las Vegas resident means pretty much anywhere. I admit that I didn't put a ton of effort into this one. I tried to get a decent composition at 16mm. (With no mobile reception, I'm glad I once learned how to find the north star with reasonable accuracy). I set my camera for 30-second exposures at f/2.8 and ISO 6400. Then I just locked up my cable release and let it shoot continuously. After a little more than an hour, I packed up and went to bed. It wasn't until I checked the resulting photos today that I would know whether or not I got anything worth posting. I've used software in the past from startrails.de, but I decided to try something new today called StarStaX. Of course, I did some cleanup in Photoshop and adjusted the foreground exposure to my liking. Omg you have such a great photographic skills. I really wish you were hear in Pakistan so that I could have contact you to take some of your signature style photographs of mine.